Okay, so are we all glad that 2008 is almost over? If you’re reading this, I congratulate you for making it through a most challenging year. 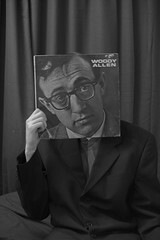 Woody Allen is quoted as saying “80% of success is showing up.” I’d have to agree with him this year. If you showed up day after day, did your job as best you could, and didn’t give up, notwithstanding the insanity that was happening all around, you deserve to be congratulated. Feel free to take 2009 off. Who can most help you be successful (as you define it) in 2009? In this glut-of-information-age, it’s people that will make a huge difference in your success. Think about it: are you limited by your access to information or by your access to people? If you had a choice, would you choose to spend half a day with the best information on leading and managing others (or whatever your focus is), or would you instead prefer to spend the time with someone with deep experience in the subject. Typically it’s the latter, and it makes sense: with people you get a two-fer. You get both the information/knowledge as well as the direction/counsel grounded in experience. So think about this past year, and think about next year. Who will help you through 2009? Who could make it a better year for you? Make a point of contacting them early in the year to see if they’re open to the idea. Maybe it’s taking them to lunch every 6 months, or coffee every 3 or 4. Or perhaps it’s an occasional email or call when you need some specific advice on a problem. Or possibly it’s the “in case of fire, break glass” type of personal one-on-one meeting when you’re in a real bind and need a second opinion or perspective. It certainly looks like 2009 will start off as another challenging year. How long it will remain a challenge is anyone’s guess. So do yourself the favor, and get some solid support for yourself. Heck, you deserve it. You just lived through 2008. Thanks for giving me 2009 off! I’ll be forwarding the news to my boss in just a minute.